Big Brother Spoilers Kaycee did not use the Power of Veto. Haleigh and Scottie remain on the block. Sam – the good news is I still can’t fit into my jeans.. Meanwhile Malibu Barbie is on the block.. They laugh.. Sounds like Haleigh messed up on her speech. K – Scottie told her that you told him whispered in his ear and told him that he’s good and just the pawn..
T – I never said that, I made it sound like that. K – he told her before nominations and after the veto ..
T – I didn’t whisper in his year..
K – That’s what he told her.. so she’s freaking out..
K – The thing is why is Scottie saying that to her..
T – I told her the worst thing you can do is go to Scottie and tell him you are safe. K – I was telling her that ..
Tyler says he’s been trying to reassure Haleigh that she’s fine. K – I told her you cannot say anything.. it’s the same thing as last week.. don’t say anything..
Brett – can we reflect on the fact that Haleigh straight up admitted she knew all That. everything I said in the speech about Bayleigh she knew..
Brett – she said do you think your speech changes everything? everyone knew all that stuff..
Brett – that’s why I go ohh? so you knew about Bayeligh’s power app? Brett goes on about calling Haleigh out for her conflicting stories, knowing about Bay’s power, Rachel was a pawn and SCottie calling out Sam 2 weeks ago in his speech. T – she does sketchy sh1t..
K – she’s very fake.. you can see right through it..
K – they though they had a big ole group with, Same, Rocks, Haleigh , Fes, Scottie..
Brett – there’s moments where .. You’re 21..
they all agree she’s doing better than they would at 21.. much better. Tyler- never.. I knew that all along.. when we were trying to get her to flip on Steve.. she wasn’t having it..
Kaycee – it’s a good week fellas.. a smooth sailing week..
Brett told them that Rocks is fuming about his goodbye message. They bring up Haleigh catching them “red handed” after she walked in on them celebrating Angela’s first HOH win. Brett – it’s just so fake..
Brett – I wouldn’t want to see her mopping around. Kaycee – she’s still a human being.. They talk about how Fes, Swaggy and Rockstar made the house very uncomfortable. They talk about how the other side would always corner people in the bathroom, FES, Swaggy, Haleigh and Rockstar. Brett- it’s fine by me look at where we are at..
B – nothing has been ohh this will be easy..
B – Battle back.. cool ..
Kaycee – we’ve been so strong and so loyal since the very beginning.. everything we said inbetween us is just between us it never got out of our F*ing circle..
T – if only we had Winston..
Brett – guess who’s leaving because of that.. Justice is served..
B – I feel so bad Winston didn’t make it can’t wait to party with him.. Hope he feels the same..
1:20pm Haleigh telling Tyler what SCottie told her yesterday. Brett going over with Angela Haleigh getting caught in multiple lies. Angela tells him Haleigh is gone next week but doesn’t know it she thinks she’s good with them all now. Brett says Angela must leave the HOH’s bed at 6am..
Brett – I laid in bed for a whole and I was up..
JC – I went to the bathroom around 4 something and she wasn’t there..
Brett – I think Kaycee and Angela are together. I think Tyler and Angela are working towards that way..
Brett – kinda but I thin kit’s all fake..
Brett – she would put up SAm.. I don’t think she would put you up.. She’s stupid she won’t put up people she’s put up before..
JC – she would put me up ..
Brett – if you put one of them up and say it’s a pawn it will not work.. If you put Haleigh up with Angela Sam is going to vote Haleigh out.. You know what I mean. B – You know what Sam is going to do in every scenario that’s the only way it would work.. take a full shot and put them next together.. Sam would keep Kaycee over Angela.. otherwise she will vote Haleigh out. B – I want Haleigh to go but isn’t a strong competitor and is pretty much alone..
Brett – talk to Sam, Reel her in. I think she would work with me an you.. that’s three..
JC – it’s too risky.. 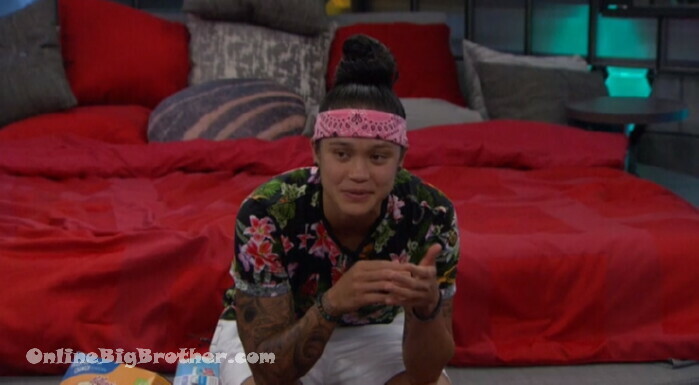 They go over how they could get away with Angela/Kaycee on the block.. Discussing all the permutations..
Brett – you know for a fact that Tyler and KAycee would vote to keep Angela you only need two votes. then it goes to the HOH..
2:32pm Scottie rocks out in the HOH. JC – I was in the DR.. You know what they asked me about right.. They were asking him about Tyler and Angela showmance. Tyler- I don’t know how many times I have to tell you.. I don’t know how many times I have to tell them..
JC – she slept up there last night..
JC – I went to the bathroom at 4:51am and she wasn’t there..
JC – they know it really pisses me off that is why they are asking. JC – We’re taking out Scottie that’s out of the question that’s fine..
JC says Haleigh can’t be trusted.. Says that Haleigh must think she’s okay with Kaycee and Angela. JC stresses if Haleigh does start working with the girls they have big group. JC – Angela is smart.. she’s the smartest of the girls.. she’s WAY smart.. she knows when to stay quiet..
JC – If she grabs her or Kaycee.. she has a full team there.. two solid votes..
Tyler- I know that.. I always check in on that.. i am aware of that. All they do is talk sh1t about Haleigh. They always talk about how HAleigh is annoying for following them around. T – it’s only that HAleigh has nobody else..
Haleigh says after her Diary room she’s gotten nervous about Thursday. Tyler- I promise you.. I swear.. you’ll see..
Tyler swears and promises she’s the PAwn and Scottie is being evicted. 7:13pm Haleigh, Kaycee and Angela.. Joking around about what the houseguests all taught them. Haleigh says Rockstar was “Stagnant” she “Didn’t move at all” then had to do 700 jumping jacks for the Veto punishment..
7:35pm Chit chat.. hot tub time..
Tyler says production knows about their feelings for each other. Angela says she went to bed around 3 .. Kaycee got called into the Diary room at three .. When Kaycee was in the Diary room she crawled back into bed downstairs. Tyler – There’s cameras everywhere..
Tyler- might be another level six blindside.. it’s been awhile since there’s been one..
Tyler says he’s overdone it with Scottie making him feel safe..
Tyler says if Haleigh spills to Scottie that she’s the pawn then they send her home. They are tired of her but Scottie is going first. I think your boy is in trouble Houka but I love your loyalty. Cruising for a Tyler 500K Win..
Who do you think is the dumbest big brother player in history? Scottie or Fes? Fes was an idiot, but despite the time to hash things out in the jury house, Scottie came back in planning to team up with Tyler. Did they not even discuss the votes from the evictions in the jury house? If they did, the spotlight should have shone brightly on JC and Tyler. BTW, I know there have been plenty of idiots (at least while on the show). My point is Scottie in one of them. rockstar and fes are dumber than scottie, but yes, scottie is up there. Coming back in, Tyler was Scottie’s only real chance. Tyler is already set so Scottie had no chance. Haleigh is an anchor. Scottie could have tried to go with JC, Sam and Haleigh. So I completely disagree. When you have lost, you should not stick to the gameplan given a second chance. Then you look to overcome what caused you to lose. In this case, all the forces working against you. So while this does not require a brainiac to figure out, Scottie should have been trying to convince Brett and JC and go from there. He needed to build. Instead, he went with what he had built. I am done with him. Scottie, absolutely Scottie. Fez is dumb, incredibly dumb…but Scottie got a second chance, after eviction, after sitting a week where he could hear total honesty from Bay and RS and he’s actually taking Fez’ playbook…but going even dumber…thinking he can just steal Tyler away with a month left and become his new ride or die. the more i think about it the more i think L6 should keep scottie. both are roughly equal to win comps, so that argument doesn’t hold a ton of water. and hayleigh is most likely to put up angela/tyler with kaycee/brett as a replacement should she win hoh next week while scottie probably puts up, or can be talked into putting up, jc and a pawn (i would think brett is the pawn, but they could probably talk him into putting up sam). next two boots they want the remaining player this week and jc out, so why not keep the guy targetting jc? on the flip side, keeping scottie does alert jc to his position in the house but i really don’t think he can do anything about it, so i’m seeing an argument to keep scottie. still think he’s going to leave though. L6 is made up of hippocrites. <sp. ?They talk behind people's backs and accuse them of being the SAME way THEY are. The Hive WERE nieve yes..but B.B. gave them the shaft as well. have watched EVERY episode since day one. Use to looove it. THIS year has disappointed me. Alison Grodner and Rich Meehan are a disappointment also . Tyler scooted up his rope and both feet came off his disc and they chose to ignore it (probably like this comment, ….it most likely won't get shown.) When I used to read it was 'fixed' I didn't believe it…this has shown me the light. They have their favorites, this action shows it. Haleigh SHOULD HAVE won. I am still at a loss at what you think scottie has done to warrant him being AFP? I haven’t seen anything that good from him. You haven’t once answered what he has done, I am starting to think you can’t even think of a reason for it. Scottie is the only nice person in the house,except maybe Steve but I barely remember him. On another note what’s everyone’s opinion on the HOH comp regarding Tyler lifting both his feet off the disc? People on IG are freaking out saying he cheated and Hayleigh really won. I’ve watched the episode over and the only rule Angela said was they couldn’t sit on the disc. I don’t understand what everyone is going on about. Maybe I missed something. You didn’t miss anything. Tyler didn’t cheat. I think the rule is mainly there to keep the HG from absorbing the impact of the wall hit with their legs. So, production probably only looks for it when they are getting hit. Technically he broke the rule, but it wasn’t to keep from hitting the wall. It didn’t really give Tyler an advantage, and no one in the house noticed or protested. Given the previous taylored hoh and hacker comps, and how production loves Hay, I doubt it’s some conspiracy to keep her from winning. If anything production is probably kicking themselves for not realizing they could have had Hay win and even things back out. They all seem pretty set that Scottie goes followed by Hayleigh & Sam depending on HOH’s and veto. I can’t wait to see what JC tries to pull. jc seems deadset on an all guys alliance but brett and tyler don’t seem into it. Simon can you fill us in on why Brett gave a speech? deal Haleigh proposed in her speech. And Brett tells JC his intention is take out Angela with Kaycee on block with her. I thought they were talking about Brett’s speech when he was on the block with Rocky. Yes .. I made a mistake when writing that bit. I’ve corrected it now. Thanks everyone. Thank you very much margaree! What prompted Bret to give that speech now? I wonder? They’re referring to the speech Brett gave when he was on the block. The only reason Brett brought it up recently was to lie about his conversation with Haleigh in order to cast doubt regarding her truthfulness. Obviously, he’s lying to try to get rid of Haleigh, exactly as he’s done with other houseguests! Unless he can pull off a timely HOH win, he’ll never make it to the top three. Feel free to brag about the Hive. LMAO. Swaggy has been gone since week 2 and is still acting way more arrogant than L6! Yes, but you have to admit, his tweets and the tweets of his twit GANG, are absolutely hilarious…maybe more so because they’re intended to be serious. and destroyed our game over & over again, adapting to every situation to do so. Which any of those counterfactuals wouldn’t change. L6 lucked out because the hive was full of idiots! Gee. When a team that included two guys that would say aloud that there wasn’t a comp they couldn’t win (Saggy and Fester), A pageant girl that required oaths of subserviant loyalty before nominations when she was HOH, and a social injustice collector that believed big brother should be a charity, along with the recipient of the twilight zone edit aren’t thought to be the most arrogant alliance we’ve got to realign our perspectives. Heaven forbid a small group gets together and celebrates how loyal and cohesive they have been, no matter what’s been thrown at them. See, I feel like you, like a lot of people, don’t get what arrogance means. They’re with themselves, being happy at what they have accomplished. That’s not arrogance to me. I bet you were the last one picked in dodgeball huh? They literally asked Hayleigh WHAT kind of competitions she could win….and threw two in a row at her. They gave Kaitlyn a puzzle that a three year old could put together….Rockstar and Bayleigh were two of the most racist people in there…WE voted for Tyker to get an app THAT HE DIDN’T EVEN HAVE TO USE….so what show are you watching? I agree…has anyone see the video from the comp where Tyler takes both feet off the disc…and still won!! You mean like when production ask Haleigh what she was good at and that’s what the hacker comp and the next comp was? I have a feeling they’re “arrogant” because they have not just one, but THREE (3!) straight white males in their posse who aren’t obviously virgins. Plus there’s that whole being successful problem that’s equally infuriating. And to add insult to injury, they’re enjoying themselves. They are extremely loyal which is why I think people like them. The way hive keeps jabbing with their one liners to insult them is childish. That just makes them all a little more endearing..
i would love to see Kaycee and Bret final two, with Kaycee the winner !! Kaycee could win this. People like her and she is good at comps. She sure could. Anyone in L4 can win it at this point…and come in second…and make AF. I’ll be happy with whoever from L4 wins the three. I’m just over Tyler and Angela. I know I’m in the minority on that , but I’ve just never jived with the whole Tyler thing. I hope Tyler and Angela are the next ones to go! I’ve been thinking a lot lately about how Brett could take this thing, especially watching how easily he socializes with Hay and Scottie just like he always did when he was a spy. Think about it. The jury wants to agree on one person and aside from his fracas with RS he was pretty much in and around the HIVE and not responsible for any of them going out. He’s also got a lot of charm and ease with others which is going a long way at this point while Tyler is becoming remote and distant holing up with his new interest. Talking about all Haleigh’s final two deals…Tyler can you say hypocrite? Sounds like someone is a little jelly? I don’t think there is anyone in the house that would even nominate Tyler except Hayleigh and she is living on borrowed time. Tyler is looking pretty good right now. I know Tyler has several final 2 deals however I think he actually only told Kaycee the exact words final 2 correct? The conversations with Sam were basically he has her back. Bret and JC approached him with a F2 and how could he say NO without outing himself. Is that correct? He said in DR he had a final 2 with everyone. I love the game but by no means am I “jelly”of any player. Just pointing out Ty’s hypocrisy. Tyler is using her deals to his advantage. Super genius. i think sam made him pinky promise that they’re final 2 a while back, but you’re mostly correct in that tyler has only said final 2 to kaycee while everyone else has said final 2 to him. I think Sam was Tyler’s first f2 “promise”, but he has the same agreement with everyone except Haleigh and Scottie. This is what cost Paul Abraham the win! Paul’s arrogance, cruelty and lack of honesty cost him the win, not F2 deals. And he can also say “winner”. At this point, I’d be very shocked if he didn’t win first, second or AF. It’ll come down to the final comps and who can sell the jurors on who’s the most pivotal player in L6/5/4. It should be good. Yep. He had no choice but to go for HoH this time because of Haleigh. Soon he’ll have to avoid the HoH’s (let someone else do the nominations) and only go for the veto if absolutely necessary. It’s going to get tricky and as you say, it should be good. I don’t think throwing comps at this stage is going to be good play. There are too many people going for and in the running for that $500k. They know after Haleigh it’s dangerous to not be safe as HoH. Plus whoever wins will be able to point to tangible moves they made as HoH and veto holder. They all have a solid case for any moves L6/5/4 made so now HoH’s and vetoes become proof of control. Yes, he can and his final 2 people are still around so he can still sell the lie. The irony being Tyler has actually protected his final twos as long as possible by a combination of intelligent and loyal game play whereas H is only interested in deals with whoever’s in power at the moment, and look what happened. How is Tyler a hypocrite? Brett was talking about Hay’s final 2s, not Tyler. Is Tyler supposed to rat himself out to stand up for Hay? Silly. Kelly is jelly of Tyler. GREAT GAME PLAY KAYCEE. Keep Angela, Tyler and Brett thinking alliance. Moths to a flame. Make it to final 4 you just have one HOH to win. You win the whole thing if you can beat Tyler in 3 comps and choose Angela. It’s not that America loves L6. It’s just the other side was so stupid. No, I think that most of us do love the fact that they finally have people who can play the game…..It has been a long time coming…. It would have been more entertaining if the decent players were on opposite sides. Too bad, terrible, short-sighted play was on one side and L6/5/4 had folks looking long term and who trusted each other. Still was a good season though. 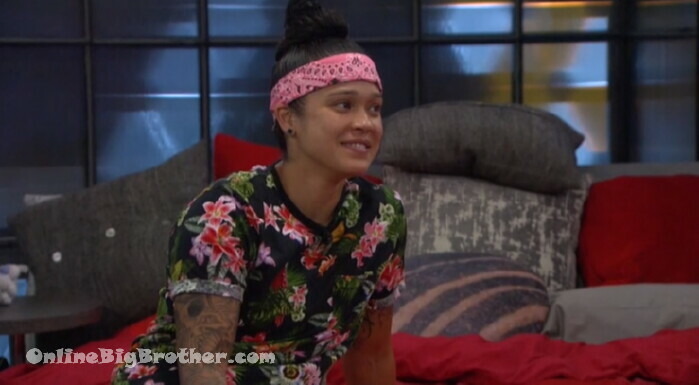 I am saying it is so smart of Kaycee to say that to reinforce the alliance so nobody is disloyal and tries to do something big. If Kaycee is in the final 4 she has a great shot at winning it. Tyler is the only person standing in her way. If he wins and picks someone else then she loses but Kaycee is smart and athletic, I don’t know what the 14 thumbs down is all about. If the alliance stays strong Kaycee has the best chance to win. Tyler I think the jury will be bitter and he will lose. I’m loving Brett’s game. Pointing out how he has pissed off the jury members is an excellent strategy to show that he is good to bring to F2. He is articulate, charismatic and creative enough to sell that snake oil too. Brett would only lose to Kaycee or Tyler right now. And, if the jury is indeed bitter, Brett may even win against Tyler..Tyler is putting such a huge target on himself he is at the tipping point he may have to win out the season so he is less and less likely to get to the end if people compare notes. Kissing Angela? Really? That is not good strategy unless you think she is a good shield to bring over the next couple weeks. So far, I only recall Brett involved in conversations with JC that target Angela and Kaycee; not Tyler. I’ve not see Angela and Kaycee talk about targeting Tyler either. Indeed, other than Haleigh, I really don’t know of anyone actually targeting Tyler. I’m just not seeing this huge target on Tyler yet. yeah, only hayleigh is targeting tyler so whomever she puts next to him will be voted out. part of me thinks tyler wants angela voted out in such a circumstance as it puts someone likely to advocate for him in jury. Sorry d but no one in that bitter jury will listen to Angela. They are all jealous of her. Let me guess, 4th place would be Ang?!?!? I agree. He put the alliance together with his first HOH win and keeping Sam safe and befriending JC. He is the glue that started it all. He does deserve the win but with the losers in jury that are so bitter he probally unfortunately won’t unless he takes Angela. Tyler has to win to keep L6 safe! He and Angela are the ones that have kept this alliance safe the majority of the game with HOH wins. Totally agree, but the veto comps are just as important; sometimes more so. Kaycee has pulled out two crucial veto comp wins. Good points. But if they aren’t sent packing, he loses also to Hay, Scottie, and maybe even Sam due to jury bitterness. L6 still have work to do. There’s no way the jury goes to Sam. Haleigh or Scottie somehow make it there, they win and I would say they deserve it. It would be like coming back in the fourth quarter after being down 60 points. She’ll have to win every veto. I can see JC dropping a rouge vote to try and put a target on Sam this week. He knows that nominee options are becoming limited. I don’t see blaming it on Sam working out well for him at all. Sam has always owned her vote. So Tyler would believe her if she said she didn’t do it. Guarantee she won’t go against Tyler. Tyler knows that. And with him knowing jc’s game. He will know it was him. That would be a very stupid move for JC to pull. That being said. Hope he does it. I am ready to see JC on the block. Should be very entertaining. jc seriously underestimates how much L6 trusts each other. it’s not like the hive where you accuse someone of lying and they buy it. L6 will compare notes and factcheck anything jc says. i think he pretty much screwed himself convincing faysal to take out scottie instead of letting faysal take out angela. i don’t think it will work but I could see JC doing it. He sees the numbers dwindling down and he is starting to panic. I’m with you in that Tyler is totally on to JC’s game but JC and Brett are not dumb and with Tyler falling under Angela’s spell he has really put himself in jeopardy. does tyler still have the power app? I believe that expired last week. Sometimes I wish rather than Jury battle back, that instead, they would bring back the first player evicted. I always feel bad for them because they never get a fair chance. *** YAWN ***. This is when the feeds get sooo boring. It’s becoming too predictable and things need to get mixed up with a juicy twist. Come on Big Brother! BTW Kaycee, not loving Level 6 so much. Not anymore. Dull, dull, dull. Watch for things to heat up once Hay and Sam are gone. JC and Brett know they are sitting at the kids table in the Level 4 alliance. JC isn’t part of the Level 4. In previous juror return situations, the returning juror is told explicitly by production that they are not allowed to discuss specific conversations or deliberations that are being made in jury. It is the definition of using production as a strategy. So. Why have they allowed it this season? Well, imo, the house guest being given the golden power of twilight zone edit is on her last legs. How can production change this course? ‘Fail’ to explicitly tell a returning juror not to discuss deliberations, so that the alliance in power becomes worried or paranoid, thereby causing one of the alliance to possibly break ranks so that the golden child can last further in the game without d/r monkeys telling a house guest, “don’t target that person,” like they did in season 18. Oh look. After the jury discussion revelation, Brett is considering breaking the alliance. Who could have seen that coming. So next week, the remaining Hive member will get a reprieve when there is a backstab. Then survive another week when there is retalliation for the backstab. Look, I found more tinfoil for my hat. i worry that their choice of edit is saying far too much (cough cough haleigh’s episode edit is so much fertilizer i can smell it from here) about who they are nicoling the season around. I think the good season happened in spite of production, not because of production. They’ve been attempting to steer the season away from the direction it was going for weeks. Agree 100%. Kaitlyn was clearly suppose to solve that puzzle made for a five year old. Haleigh was suppose to win the typing…err Hacker comp. Fez was suppose to win the ball comps. They never figured L6 would keep flipping the script (the saving grace of the season). I believe in previous season the jurors were isolated from each other. This season was a problem because Kaitlyn screwed up the simple puzzle. I don’t think they were planning on a jury buyback and things were fumbled trying to figure out how to still make a double work. i know it’s different country… but i’m specifically thinking of bbcan juror vote back season one. The jury had spent time coming up with a plan. but the one that returned was specifically told he could not discuss jury deliberations with other house guests. Of course there used to be a rule, that was difficult to enforce, that jurors were not allowed to discuss jury deliberations without production present (at least before season 11 this was the case). Said rule was impossible to strictly enforce, because there was no real consequence attached, but the rule was (and possibly still is) on the books. you sure about that? pretty sure nicole used jury deliberation info when she returned and she was the last returning player who actually spent time in the jury house. usually it’s the just voted out houseguest that returns with no opportunity to talk to the other jurors. she didn’t use jury deliberation info as a strategy (ie take me to final 2 or you lose). she used the info she learned for her own game. Okay, so “literally” a snoozefest today. Even production is falling asleep on the job. The HGs were sleeping the entire morning. The 10 to 10 waking hours are a total joke. 5:15 PM BBTime: BB finally announces to Haleigh that she needs to wake up, then JC brings up using pots and pans to wake up Tyler, and Sam is sleeping in a sitting position in the backyard. I feel like all I’m watching on the feeds these days are sleeping HGs. Someone needs to drop this granny in the backyard “America’s Care Package” style, so I can wake these HGs up. *I only drop into the feeds from time to time to check things out. But, wow! These HGs need something to do. Little competitions where the winner picks a friend or two to watch a movie or have a special meal, they used to do that. Haleigh actually should be hoh, before Scottie fell Tyler clearly had both feet off the disk which is a violation of the rules but BB won’t do anything to hurt golden boys chance of winning so it will stay the same. Why not go to a hive friendly site and cry like a baby how it’s just “not fair”, “tyler is a cheater”, “what about gameshow laws”, “have a rewind week”, and all the other BS ‘ideas’ you snowflake losers are whining about. The majority here don’t want to here your BS. I actually Like Tyler and if Heleigh had done the same thing I would have said the the same thing. Kc’s diary says one thing Angela says anothe, I think it should at least be clarified. Big Brother gave Tyler the key and let him nominate players the following day. They had all the time to review they wanted. That’s clarification. WOW! IS THIS NECESSARY? The idea of a group chat is so that people can discuss the show and share opinions. I don’t really think the intent is to insult and belittle people that don’t share yours. Honestly, what fun would it be if everyone was just posting the same exact opinion? “ Yay man Tyler’s great, he’s the best, awesome, high five” that get old after the first post and there’d be no point to an open chat. Thank you that that comment. So many people on this board get downright mean with their comments if we don’t agree with their opinion. This use to be a fun site where a person could give their opinion. This year people “name call” if you don’t agree with them. It’s a game and those of you out there that feel the need to belittle someone for having an alternative view need to start understanding that. Stop being mean to those who don’t share your views. I was under the impression after all these years that Simon and Dawg had a “fan” friendly site that allowed for various opinions and thoughts. If I am wrong, then Simon or Dawg should let us know opposing opinions are not welcome. This is the first year that I have felt my opinion was not welcome. Opposing views are welcome. Sometimes it’s the loudest people we hear but that doesn’t mean they are the majority. Some folks are very defensive of Tyler and get touchy when someone takes sides against him. Where did you hear these rules?I rewatched Sunday’s show and when Angela read the rules prior to the start of the competition it said you can not sit on the disc and made no mention having to have their feet on the disc. Vegas confirmed on twitter that it was a rule violation. But what is done is done. Not the first time, won’t be the last. They did mention that the feet needed to stay on the disc. My son and I were talking about how difficult it would be to keep both feet on the disc with all the slop being thrown at them. I didn’t see anything with Tyler so I’m not discussing that, but they did indicate that feet needed to stay on the platform. I heard that there was no rule against not having both feet on disc, just that you couldn’t sit on it. Kaycee doesn’t make the rules so I don’t see the relevance. Big Brother can change the rules whenever it feel like it and interpret the rules however they want. If they really wanted to they could give Sam a laptop with live feeds just for giggles. Remember the coaches twist? I can’t help but laugh that anyone actually still thinks ‘golden boy’ is getting the preferential treatment when we’ve actually heard evidence and seen edit evidence that it is haleigh, not tyler, that is being given the thumbs up production treatment. Anyone that has watched her flirt strategy on feeds never make it into an episode, or seen her ridiculous drunken strategy talks that have also never made episode, let alone haleigh herself saying she knew she’d win those comps because production had asked her what skills and talents she had before the comps she won, all with the cherry on top of twilight zone d/r crap that completely revises history… and tyler is the golden boy? 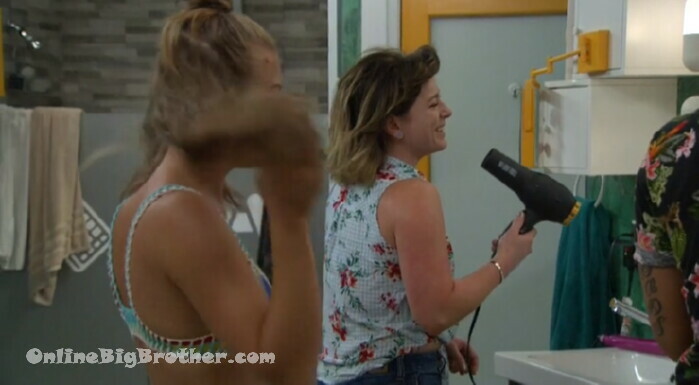 They are setting up Haleigh with a Nicole edit from 18. It’s completely not an error that the foot release was put into the episode. It was done in order to troll the hive stans so they’d get up in arms. Editing and production knows exactly what it’s doing. The precedent was already set (again in 18) when Natalie wasn’t eliminated from the comp when she did exactly the same thing as Tyler. She actually did it multiple times without infraction. As far as the ‘inner circle’ twitter spoiler that has been talking about the comp: this isn’t the first time said spoiler has gone on a tyler tear, while completely neglecting to spoil anything negative about any hive member’s shenanigans or behaviors or production tweaks. It’s almost like that particular one is a production enabled spoiler that is there to endorse the storyline and edit by only posting the negatives of one side of the house, and only tweeting glowing comments about the other side in order to increase the partisan drama. Everyone in the whole house is lying, backstabbing , or backbiting. I hope they realize how hypocritical they sound. They’re talking about the lies she’s getting caught in, when they catch anyone lying should they not talk about it? Another site has posted that because Tyler lifted both feet off the disc during the HOH he should have been disqualified. It is being stated that the rules stated by production stated one foot must remain on the disc. They are supposedly reviewing this. Anyone else know anything? It’s my understanding that the the BB Grod and other peeps reviewed this issue and Tyler won’t lose his HOH status. If we are counting BB Rule breaks, the lists for each HG would be mighty long. People are whining. Big Brother was watching the comp live, there is zero chance they are reviewing it and they would have it settled before they gave him the HoH reveal. If people are pointing it out on the internet the producers don’t care enough to disrupt the flow of the show. I’m sure if there was an issue, it would have been reviewed before the noms on Friday. A little late to be reviewing it now. It would be great if someone could produce this magical rule book that apparently everyone has read but never seen.People are spreading so much BS to create controversy and push their own contrived narrative. Vegas said nothing will change. Remember when Fessie and Scottie were writing down stuff to study for an anticipated memory contest? That’s against the rules. Just saying. He didn’t cheat, he unintentionally violated a rule that wasn’t flagged. I don’t think what he did was the intent of the rule so they didn’t call him on it. We all owe you one for this Simon. If I were Tyler I would completely isolate myself from Angela. JC and Brett are very worried about a showmance this late in the game and they will gunning to get him out if he keeps it up. Does anyone know what Angela’s website is or name of her business? Sounds like a great gift idea. Survivor only does that during the team comp phase. There’s no way to make people who don’t trust each trust each other. It’s like being assigned a best friend in middle school by the principal, it’s not going to work out. In new challenges; CBS do something!! Right!?!! Tyler could have easily said ok let’s call Brett up here and talk about this since he’s been in my alliance since day 3 and you have not. JC you have simply been a vote for us but you are not in our alliance. Outside of the whole JC getting Fes to take out Scottie. JC has simply been a vote for level 6 and create paranoid ppl in the Hive/Foutte. I personally believe JC is getting himself beyond paranoid bc the mind games he has used this entire game, which have worked beautifully, are not working on anyone left in the game especially Tyler and Brett. I think he sees the writing on the wall that he is not going to make it to final 2 and is starting to get very anxious. But now he is getting so worried that he might not even make final 5 if he doesn’t calm down. Also that all four of the L6 remaining in the house are as smart as (if not smarter than) JC. What worked on the Hive will not work on L6. I think Tyler has had JC’s number all game long. He’s been quite useful to L6. His days are numbered. I think Tyler needs to do a blindside….. have angelia/kaycee/ sam vote out haleigh and have JC and brett vote out Scottie….. have them all go after each other.